Lightweight, durable carry-ons. The 20" is great for overnight or international carry-on. 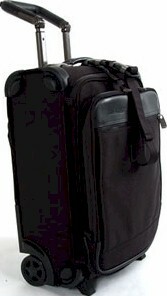 The 22" expands and comes with a handy Wrinkle Less® suiter, keeping clothes neatly packed until arrival. Comes in Black and Steel. On the Outside, these pieces are handcrafted from Andiamo's finest materials. Armor Plate Ballistic, unbreakable aluminum hardware, heavy duty YKK zippers and an ergonomically correct handle that can be pulled from the side. All these features found through-out Andiamo's Valoroso's collection. In the Inside, these fully lined pieces make extremely durable, lightweight, handy carry-ons. Wrinkle Less® packing wings and padded roll bars keep neatly packed clothing neat until you arrive to your destination. The 22" expands an additional 2 inches for added packing capacity. All Andiamo Valoroso Luggage pricing includes Free domestic shipping and more. Also, no sales tax if shipped to anywhere outside the state of Michigan. On line ordering is of the highest level secure format. We have been in business for over 50 years and offer 30 day Money Back Guarantee. All Andiamo Valoroso pieces are backed by Manufacturer's Warranty. We also can gold hot stamp your initials at no extra charge, just specify desired initials under "Special Instructions" when placing order.